What is right, and what is wrong? Which actions are permissible and which are impermissible? These are questions of ethics. In philosophy there are two fundamentally different approaches to ethics, deontological and teleological. A deontological or duty-based theory of ethics prioritizes rightness to goodness. Why should you do the right thing? Not because you'll go to heaven and avoid hell. Not because the world will be a better place if you do. No, the reason to do the right thing is just because it is the right thing to do. A teleological or ends-based theory of ethics defines rightness in terms of goodness. The reason why you should do the right thing is because by doing so you will generate something good, a better state of affairs, the result of your action. The easiest way to illustrate the distinction between deontological and teleological theories of ethics may be by considering the case of lying. If it is wrong to lie, then presumably you should not lie. But maybe it isn't really wrong to lie. Can anyone speak "the truth, the whole truth, and nothing but the truth"? Does ought imply can? Even if it is impossible to tell "the whole truth", perhaps it is still wrong intentionally to lie because when you do so you people the world with liars, who undermine the conventions of trust upon which civilization rests. What if telling a lie will save someone's life? A strict deontologist might still insist that it would be wrong to lie. A teleologist, in contrast, would be more apt to deny that lying is wrong in that case. In perfumery, do questions of ethics arise? Yes, of course. Why? Because perfumery is a human enterprise. Businesses themselves may be amoral (although strangely corporations in the modern world have been granted legal rights akin to those enjoyed by persons), but all businesses are run by people. If an action is wrong, then doing it for money does not make it right. Does it? Is animal testing wrong? PETA (People for the Ethical Treatment of Animals) has produced a list of companies which test on animals, and a list of cruelty-free companies, which do not test on animals, as a matter of principle. Is it wrong to wear perfumes which cause other people distress? Is it wrong for companies to lie about reformulation--whether (and if so why) it has been undertaken? Is it wrong for companies to seduce people through marketing to believe that they need what they do not need? Or is that just fair business practice? Is seduction the essence of marketing? Is it wrong for companies to produce knock-offs of famous perfumes? There are bona fide knock-off companies, which print on the box that they are offering a less-expensive fragrance which is evocative of a famous perfume. This is clearly legal. What about the perfumic equivalent of plagiarism? I doubt that this happens as often as some have alleged, but on occasion there may be a chemist who studies the chromatogram of a successful perfume and attempts to re-create something along the same lines. Is there anything wrong with that? Some of these issues involve a type of duplicity, which raises all of the questions about lying—whether it is wrong (and if so why), whether it can under some circumstances be right. Others of these issues involve questions about how to treat our fellow sentient creatures. But they are all about ethics. The rabbit photo is photoshopped. To answer your question about "Can anyone speak...". The answer is a resounding no. There are censors with dictatorial attitudes all over the place editing individual truth. When people cavalierly say "do a google" or "go look on wiki" and they go and believe they have found truth, we are in a bad place as a society. No longer is seeing believing. With the advent of the internet we have less truth then ever before in history. The common attitude is we have more, they are incorrect at their own peril. With the digitizing of books, history is being rewritten and edited at breathtaking speed. With holograms and photoshop and 3-D printing you can no longer believe your eyes. Society is ripe to be led to the slaughter. Thank you for these warnings! Is it wrong to write blogs that cause other people distress? Is it wrong for bloggers to lie (use photoshop image) about topics--whether (and if so why) it has been undertaken? Is it wrong for bloggers to seduce anonymous people through enchantment to believe that they need what they do not need? Or is that just fair blogging practice? Is seduction the essence blogging? What about the blogging equivalent of plagiarism? I doubt that this happens as often as some have alleged, but on occasion there may be a fake photo stolen from Google. Is there anything wrong with that? 1. You compare animal testing to blogging, but there is an infinite difference between writing a blog, which no person is forced to read, and placing defenseless animals in the position of being injected with all manner of chemicals just to see what happens to them. The animals cannot walk away; the reader can always choose to navigate away from the page--or never visit the blog at all. 2. 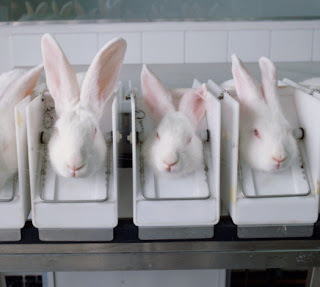 I do not know whether the photo of the rabbits at the opening of this post is photoshopped or not, but even if it is: how do you suppose that animal testing might be carried out on free-range rabbits? Are you denying that animal testing is used in the cosmetics/perfume industry? The image serves the purpose of calling vividly to mind what is done in cases of animal testing. In some ways, it is irrelevant whether this particular image photoshopped. If animal testing is carried out, it must be done in something like this way. 3. You ask: "Do bloggers sometimes seduce anonymous people through enchantment to believe that they need what they do not need? Or is that just fair blogging practice?" It seems to me that there are a lot of blogs which advocate for products and therefore can be viewed as marketing shills--even when they are not necessarily being paid to do so. My reply is basically the same as above: those blogs can easily be avoided. Just don't go there! 4. Is "borrowing images" a form of plagiarism? I think that it depends on the intent. In the case of borrowing a picture of shackled rabbits, I am quite sure that the people who produced the image would be happy to see that it is being viewed by more people as a result of being posted here. The same story for images of perfume bottles, which I frequently borrow from the web. I am not earning any money from this blog, so I cannot imagine what the objection might be. I do use my own screen shots from films, but they, too, ultimately came from films not produced by me and are posted only to make it possible to discuss the films. Thanks again for being a critical reader! We can find out right quickly if "borrowing images" is a form of plagiarism. Let me "borrow" from these blog pages, without your permission, without telling you, and without crediting the source other than, "Google". The comma after the word "they" doesn't belong. Thanks for your concern about these legal issues. A new policy wouldn't be bad. So far all your policies have been smashing! That anonymous is BRILLIANT!!!!! You are lucky to have them in you midst. By definition, posting a "no comment" is a comment.